For myself, after making my first basket, I couldn’t stop weaving. I wove every day for three years, mostly from patterns. 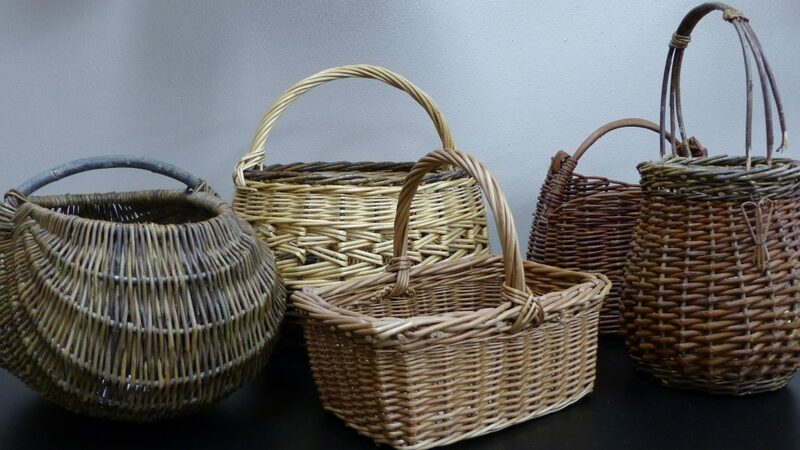 These were functional baskets that reflected my skill level, and in many cases, revealed skills I had not yet developed. During these years I also wove many of the new ideas in my head. Those original pieces were interesting – while most clearly reflected other baskets I had made from patterns, some were very unique. Some were kind of pretty and some of them were down right ugly. Somewhere around basket #500 I noticed a big change in my work – my skills had greatly improved and my original work was – well – nice! While basket weaving had always felt natural to me, I was mastering techniques and had more ideas then I knew what to do with. By basket #1000, I not only knew I was a master basket weaver, I was brave enough to say it outloud. I’m not saying I had arrived at the top of some ladder. There is always something to learn, something to develop and more to understand. I continue to weave several times a week, I continue to try new things, and I continue to practice the basics. Although, I do believe that excellence takes time and hard work, I don’t want to imply that only experienced artists have something to offer the community, or that everyone’s path will be like mine. I have found the basket community a wonderful place to share and learn. We can learn from each other regardless of how long we have been weaving. Sometimes a new weaver sees things so clearly. Sometimes the experienced weaver can help us change a bad habit. My Point – Regardless of your weaving skill level, invest in yourself. 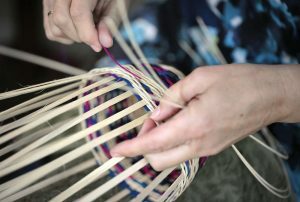 Give yourself time to learn, take time to do the work of learning and honing your basket weaving skills. Focusing on excellence will enhance your creative ideas. Use basket patterns and books. Weave other people’s designs. Make notes about what you liked and what you didn’t. Don’t berate yourself (or unfairly berate a teacher) when your basket doesn’t look like the class sample, rather ask yourself “what did I learn?”. And then, try again. Remember your teacher probably has more weaving experience than you and has probably made more than one sample of this design. Weave the ideas you have – then evaluate them, but don’t be overly critical. Our creative ideas are sometimes ahead of our skill level. If something doesn’t ‘turn out’, it is not failure. It is part of the process. Part of the journey to excellence. If a basket emerges lopsided or ‘ugly’. Don’t fret – again, ask yourself “what did I learn?”. Often we consider a basket ‘ugly’ because it turned out differently than you had hoped. You may well like it tomorrow or your best friend may fall in love with it! Allow yourself to burn something you really despise. Believe me, it is freeing! Take pictures of your work. Document how your skills are progressing. Impliment some creative practices that encourage you to think outside the box. Weave simple baskets, as well as baskets that challenge you. Weave often. Just Weave! I believe that creativity is just as much hard work as gift and I can’t separate the striving for excellent skills with creative development. So practice. Basket weaving, art, is worthwhile work. This post started because I wanted to share some practical ways to encourage creativity … but then I got side tracked thinking about how creativity is the outcome of our striving to excel and perfect our weaving. And how, as our skills are perfected, our creations become more and more beautiful. Next, I will post the things I do to encourage creativity, the things I practice regularly. PS My last post was two months ago, I had fully intended to post more, but life forced me to take some much needed personal time. Now that the holidays are over and the temperatures are ridiculously cold (-7 this morning (!! )), it’s time to get back to work! I am looking forward to writing more, finishing some articles that are in process and adding more tutorials, but first a conversation on creativity. Have you been listening to me as I mutter while I weave and un-weave? I really enjoyed this entry and found it quite inspirational. Looking forward to more about creativity. I think of myself as good at reproduction but not creative. A severe lack of confidence perhaps. This year I have scheduled several classes that are way out of my comfort zone, i.e. kudzu, antlers, and more of my favorite, willow. Hurry! I want to be creative! 🙂 Thank you for your note …I am so glad that you are stretching yourself and good for you for weaving, unweaving and reweaving! These are the things that build confidence and perfect our skills. Imagine how fun that would be to go to school for three years to weave! Wow! I loved your article and am anxiously awaiting your tips for creativity. I know, wouldn’t a dedicated three year basket weaving course be exciting! Thank you for your easy to use gretchen border, I have struggled with that for years, and yours were so easy to follow! Finished my sled ! Thank you. This is just what I needed to hear. I get into a “weaver’s block” when I try to create my own design. Your words are encouraging. 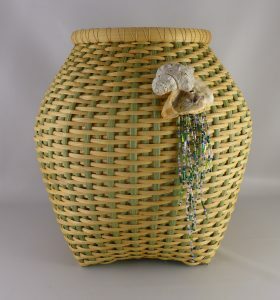 Weaving baskets entails a challenging skill set, but creativity can be another skill set in itself. Your suggestion to just continue weaving is great advice. A great pep talk to kick off a new year! Thanks Annetta!